After I joined magenticNorth last year I got introduced to the world User Experience (UX) having had the pleasure of working with a team of talented creatives. Its an area of digital i’ve become increasingly involved with by attending conferences and meet-ups such as Ladies that UX plus through my work where I have been involved in user testing for various projects. I think it’s useful to recap on what UX is as it can often be mistaken to simply mean wireframes for example. According to the Nielsen Norman group who are leaders in the field – “UX encompasses all aspects of the end users interaction with the company, its services and its products”. The below graphic is a great illustration of what UX encompasses showing how all the component parts come together to create the brand experience. 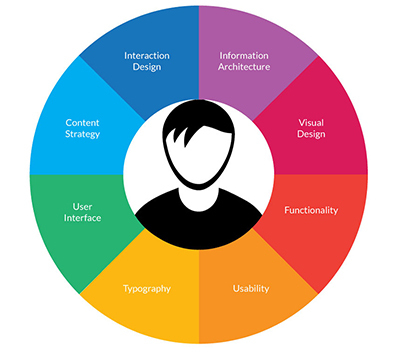 Each one of these 8 areas have their own respective specialisms as well so it can sometimes feel like UX is becoming too siloed with only certain parts of the journey take into consideration the needs of the user. UXmatters highlights user research as the key activity that informs overall UX design. Which is an important point as I believe this is often overlooked. User testing is a growing area within digital as a whole. In the past it’s been all too easy to design based on assumptions, which has resulted in the creation of products that no user has a desire or need for! (quite often a start-up with a great idea fails to get traction because its product is designed by the developer and not the end users perspective). In essence user testing is good old fashioned customer research which thankfully seems to be making a comeback! With the pace of technological change and growth in e-commerce there’s growing focus on optimizing user journeys. Running user testing sessions is a simple way to get validated insights based on the facts and true user perspectives. If you already have some basic user personas user testing is also is a great way to validate and build on your audience characteristics. In the last year i’ve worked on projects which have included user testing early on in the project and have seen how invaluable the early insights have been in steering the product down the right path. Incorporating learnings early on allows the product to be built in line with user expectations and these can then be tested throughout the development phases. Functionality – does the user even want or need the solution you are proposing? Interaction design – do built in interactions help or hinder the user? And based on my experience of running small scale user testing sessions I can vouch for that. You’d be surprised how many different responses you can get within a small group. Plenty of insight will come out of the session to make you question certain assumptions. If you’re struggling to get buy in from your manager then there’s a wealth of content out there on the merits of user testing. Though here’s two great resources i’ve come across. What type of user test to run? There is also the question of what type of user testing/research session to do. As an initial recap two categories to be aware of are moderated and unmoderated. According to userlytics Moderated Testing is where “a moderator asks questions, instructs and directs respondents in terms of tasks, and ensures that the respondent is guided in such a manner that the goals of the usability or user experience study are accomplished. Speaking one-on-one with a user about your product will unveil a lot more than just having the user follow a set of steps on their own as it gives you the opportunity to probe the thought processes or behaviour. So on this basis moderating testing can be invaluable during the early phases of any project. Typically (although not always) unmoderated testing is conducted in a remote session, i.e., not in a lab environment, but in a respondent’s home or office or other “real life” location, sometimes referred to by market researchers as “field testing”. This approach allows for more natural usage such as using a mobile on the go to be tested. For example if your app is targeted at a mobile audience then this would be especially useful. Do you think Uber haven’t done field testing of their app? This can also help uncover issues with things like mobile signal and checking that the app handles this. A benefit of the unmoderated approach is that the participant can be more relaxed performing the test in real life locations and relieves any tension they might have in an artificial moderated testing environment. The good news is that it’s no longer expensive! For example usertesting.com lets you access real people speaking their thoughts as they review your products you can even test apps! Finally I wanted to mention two great companies that are providing facilities and guidance on user testing in Manchester. I can honestly say after attending a number of user testing sessions I’ve seen the invaluable insights they provide and help to shape the end product with the user in mind. Helping to ensure your product gets off to the best start possible. What’s your experience of user testing? I’d love to know what your top tips are? Tweet me or leave a comment.